Mothering Sunday in the UK is the equivalent of Mothers' Day in other countries. What happens on Mothering Sunday in the UK? Mothering Sunday is a time when children pay respect to their Mothers. Children often give their Mothers a gift and a card. Many churches give the children in the congregation a little bunch of spring flowers to give to their Mothers as a thank you for all their care and love throughout the year. When is Mothering Sunday (Mother's Day)? Mothering Sunday (Mother's Day) is always the fourth Sunday of Lent. Why is Mothering Sunday on different dates each year? Mothering Sunday was also known as 'Refreshment Sunday', Pudding Pie Sunday (in Surrey, England) or 'Mid-Lent Sunday'. It was a day in Lent when the fasting rules were relaxed, in honour of the 'Feeding of the Five Thousand', a story in the Christian Bible. The more usual name was Mothering Sunday. No one is absolutely certain exactly how the name of Mothering Sunday began. However, one theory is that the celebration could have been adopted from a Roman Spring festival celebrating Cybele, their Mother Goddess. As Christianity spread, this date was adopted by Christians. The epistle in the Book of Common Prayer for this Sunday refers to the heavenly Jerusalem as "the Mother of all us all", and this may have prompted the customs we still see today. It is known on this date, about four hundred years ago, people made a point of visiting their nearest big church (the Mother Church). 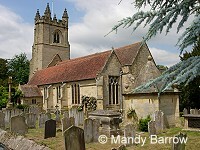 The church in which each person was baptised. Cathedrals are the 'mother church' of all other churches in an area ('diocese'). 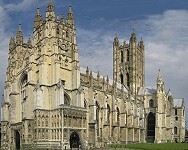 Canterbury Cathedral is pictured below. People who visited their mother church would say they had gone "a mothering." Young British girls and boys 'in service' (maids and servants) at the local Manor House or in a Mansion, were only allowed one day to visit their family each year. This was usually on Mothering Sunday. For some this could be a significant journey since their mother may have lived some distance away, indeed another town altogether from the Manor where they were put in to service. Often the housekeeper or cook would allow the maids to bake a cake to take home for their mother. Sometimes a gift of eggs; or flowers from the garden (or hothouse) was allowed. "Maids were put in to service for the Landed Gentry and paid a small salary but boarded free of charge. They dealt with everything from cleaning,washing to cooking, so to have a day of rest and be able to visit their mother was quite a privelledge." 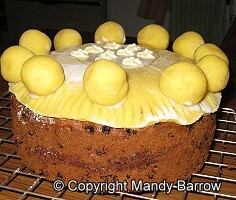 Mothering Sunday is also sometimes know as Simnel Sunday because of the tradition of baking Simnel cakes. The Simnel cake is a fruit cake. A flat layer of marzipan (sugar almond paste) is placed on top of and decorated with 11 marzipan balls representing the 12 apostles minus Judas, who betrayed Christ. A Simnel is still made in many parts of England today, although it is now more commonly made for and eaten on Easter Day . England is one of three countries in Great Britain and is part of the UK. 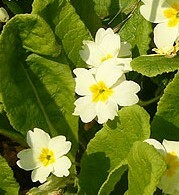 I remember helping to collect the bunches of wild flowers for the Mothering Sunday church service. I loved going up during the service to collect a bunch for my mum. In recent times Mothering Sunday has in Britain taken on the name and character of the US Mother's Day. The original meaning of Mothering Sunday is often unknown, although people are aware that it always falls in the middle of the Christian festival of Lent.